* NOTICE: This line is a.k.a. under other more common names. PS. Most 'professional' + 'expert' members will probably be able to find the one and only correct numbers + letters combinations within minutes, so... maybe those members should not spoil all the 'fun' at once for the less experienced members; by the way, part II of the QUIZ will be available very soon... and I think nobody will solve that quiz within less than 1 hour!! Thanks for creating 2 quizzes Martijn. This is the easy quiz? There are two lines here I never heard of, so I'm guessing! Well, I am aware that 2 of these lines were never mentioned in the forum discussions in the past (neither at the PI forums & HandReading Cyber Cafe). However, I decided to include both lines in the quiz since the authors present a fascinating theory about the line. Anyway, nice to see that even part a of the quiz has a 'tempting' element!! Well done, you've managed to solve part 1 of the Quiz at once!! well done tap! I struggled with 3 of them, finally found two and then number 8 was by a process of elimination! I hope other people will have a go at the quiz without looking at your answers! 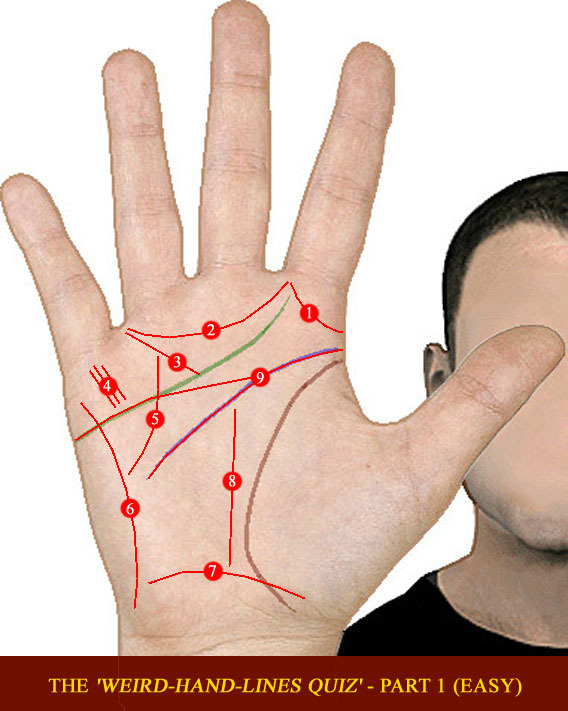 I know all the lines in Quiz 1 except for A, B or G. I have over 20 palmistry books and none of them have these lines in them. I also searched the Internet and could not find any information. Where can I find more information about these lines? Is there a good book you could recommend as well. Thanks for your help! Lori wrote: I know all the lines in Quiz 1 except for A, B or G. I have over 20 palmistry books and none of them have these lines in them. I also searched the Internet and could not find any information. Where can I find more information about these lines? Is there a good book you could recommend as well. Thanks for your help! Regarding the 'Buddha line' and the 'Equipoise line'... so far there is hardly any info available online. 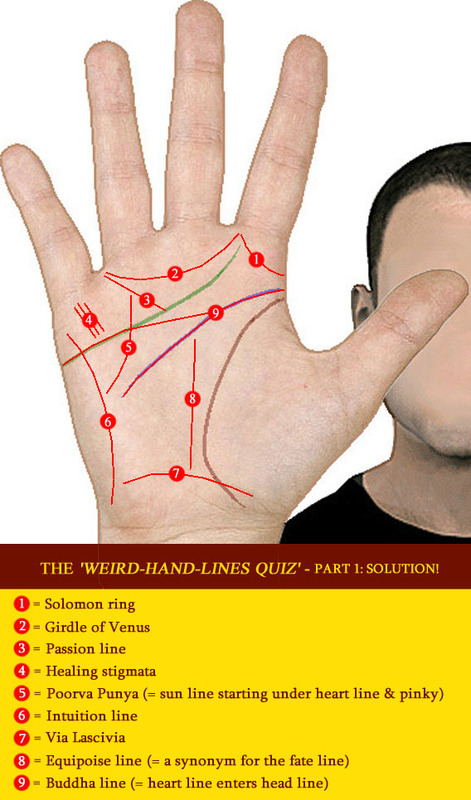 However, the first line is described in the book of the Japanese palmist Hachiro Asano, titled: "Hands - The Complete Book of Palmistry". And the second line is described in the two books presented by PDC chirologist Arnold Holtzman from Israel. "... the integration and balance this line effects, essentially, between ego and id - between the out real, physical, material, and social dimension with its aligned energy programs at the thenar eminence, and the largely unconscious inner world of surrealistic abstractions with its own marvelous energy programs at the hypothenar eminence". I hope I answered all your questions!? Martijn (admin) wrote: I hope I answered all your questions!? Yes Martijn, you certainly did. Thanks for the great references. I will be sure to look into them further. I imagine that you must have quite an extensive library. Do you have your own personal favourites that have useful information that aren't in other books? Sure, I have my favourites... in general, I always prefer book which provides very detailedx + specific info. But my answer would depend on the topic that you have in mind. And since I am aware that there are so many topics in this field... I can not simply give you 'my' short list of books - ... because my list is actually very 'long'! Nevertheless... ...I must admit that this is a missing element on my website: another project to think about - thank you!! Earlier today I received a request from Cynthia, who asked if I am willing to present the 'solution' of part 1 - sorry, I hadn't noticed that Tap had deleted her answers!